The Scovie Awards recognizes the top savory, spicy and fiery food products in the world. Gorji Gourmet Foods have won 23 Scovie Awards in the Fiery Food Challenge competitions in 2017, 2018 and 2019. The awards were named after the Scoville Scale, a measurement of the spicy heat of a chile pepper. It is one of the most competitive blind tasted food competitions. Hundreds of products are entered and go through rigorous tastings to receive the top honors. Dave DeWitt, founder of the Scovie Awards said there were 126 total companies entering this year, with entries from 30 states and 8 countries. “Companies from all over the world continue to recognize the Scovie Awards as the most competitive and challenging blind taste-tested event in the world,” DeWitt, said. Winner of 30 Awards In Blind Judging Food Competitions! Between Food Awards at Zestfest and the Scovie Awards, all eight Gorji Gourmet Foods have now won 30 food awards! Chef Gorji’s three new items, Hummus, Caesar Dressing and Remoulade have now joined the other five Gorji Gourmet Foods at the winners table. In 2019, Gorji Gourmet sauces took home gold, silver and bronze awards in six categories. Chef Gorji’s newest entries, Hummus, Caesar Dressing and Remoulade all won in their categories. Hummus won Gold and Remoulade won Bronze in prepared dips. In Salad Dressings, Caesar won Silver and Pomegranate Vinaigrette won Bronze. Puttanesca took home silver in pasta sauces and Dipping Oil & Marinade won Bronze in the barbecue category. 2018 Scovie Awards bestowed Gorji Gourmet Foods with gold, silver and bronze awards. Puttanesca won Gold in Pasta Sauces. Dipping Oil & Marinade took Silver in the Cooking Oil division and Pomegranate Vinaigrette brought in a Bronze in the Salad Dressing/Marinade category. This is Puttanesca’s third Scovie Award including a top spot gold Scovie Award. Gorji Gourmet Dipping Oil & Marinade also known as Steak Primer, won in the marinades category for barbecuing. It is cooking olive oil you can cook meat, fish and vegetables. See Chef Gorji’s recipe for Grilled Chilled Avocado with Puttanesca Sauce and Poached Shrimp in the Scovie Spotlight where it is featured. The recipe is from Chef’s award-winning Zing! By Gorji Cookbook. Pomodoro:clean tasting and vibrant, but not hot. It is a flavorful base on pizzas, pastas and any recipe using tomato sauce. Puttanesca:perfect on any tomato sauce recipe calling for extra “zing”. Arrabiata Diavolo:the spiciest. It adds zesty heat to pasta, pizza, seafood, burgers, bloody marys and wherever the devil makes you do it! Dipping Oil/Marinade:olive oil that is perfect as a dipping oil or as a marinade for all kinds of meats, fish, poultry and vegetables. Chef Gorji uses this exclusively in his kitchen at Canary By Gorji. Pomegranate Vinaigrette: a lively salad dressing made with olive oil. Ideal for salads, as a light sauce for meats of all kinds, or as a marinade. All five Gorji Gourmet brand sauces have no preservatives or added sugar and come in 24 oz. glass jars. These sauces were developed by Gorji from recipes he created and cooks with in his kitchen at Gorji Restaurant, to easily make gourmet tasting dishes without hours of preparation at home. Visit gorjigourmet.com for more information about Gorji Gourmet Foods. 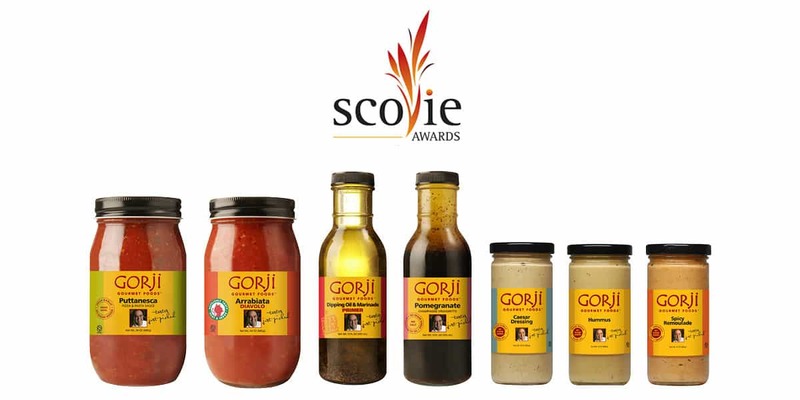 No Replies to "Scovie Awards: Gorji Gourmet Wins Gold, Silver, Bronze"